Nicolas Cage picks projects that can be hit or miss (Bringing Out the Dead vs Bangkok Dangerous); Jake Gyllenhaal seems to follow a similar pattern of doing the safe film, then the artistic one ( Prince of Persia vs Donnie Darko). 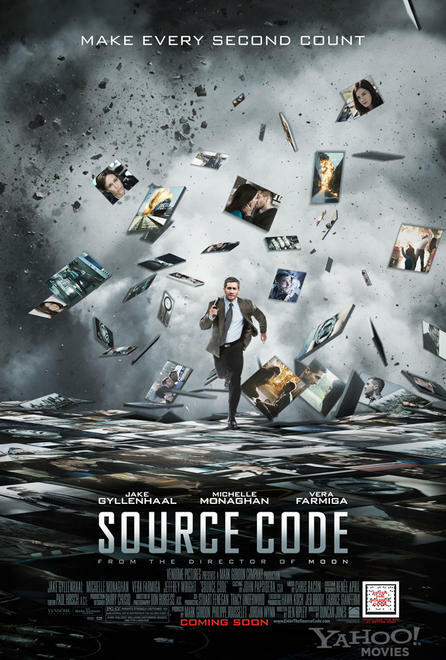 Thankfully Source Code, Gyllenhaal’s latest, is a taut sci-fi thriller worth seeing. Gyllenhaal plays Captain Colter Stevens, a helicopter pilot who finds himself in an unknown facility in which he is sent into the mind of a train passenger eight minutes before he dies due to a terrorist attack. In these eight minutes Stevens must discover who bombed the train before he is snapped back to the present. If there are concerns about the whole film being spoiled by the info-tastic trailer for Source Code, I’m happy to report that’s not the case. Despite knowing what occurs every eight minutes, Colter and the organization Quantum Leaping him onto the train remain brain ticklers whose intrigue maintains the story’s momentum. As a mix of Quantum Leap and Groundhog Day, the repetition of the events on the train could wear thin (Vantage Point), but director Duncan Jones manages to keep it lively by freeing himself from the convention of having to keep events in the past constant. Stevens wonders aloud at the train “being the same but different” and within that paradigm Jones allows himself to shoot the minutiae in different ways (a ticket being taken by the conductor shot from angle A, angle B). He doesn’t get carried away with the freedom, but does enough to keep you watching the film, not your watch. Comparisons will surely arise between Source Code and the 2006 Tony Scott/Denzel Washington film Deja Vu which has a similar premise, but in terms of which film successfully tells that type of story, Source Code nails it with touches of hard sci-fi and real drama. Whether it’s pushing the psychological time travel, the thriller angle, or even the budding romance between Stevens and train passenger Christina (Michelle Monaghan), this is a script obviously written with care, an endangered animal in these parts. And it would be dead in the water without its small cast. Vera Farmiga as Goodwin puts a human face on the military commanding Stevens’ mission and Gyllenhaal adeptly taps into the psychological suffering and tenacity of a man who dies every time he fails. From head to toe this is a film worth seeing. *I would consider the moment frozen in time to be the ending; the rest is kind of silly fluff. This entry was posted in Reviews and tagged Duncan Jones, Jake Gyllenhaal, Moon, Sci-Fi, Source Code. Bookmark the permalink.